Seeking success in sweepstakes, lotteries and games of chance? Increase your odds of winning by keeping a good luck charm at your side or having a "lucky" spell cast in your behalf. You have nothing to lose. 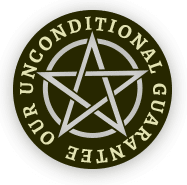 All Gambling Spells and Gambling Charms from the California Astrology Association are risk-free: If they don't profoundly improve your life, we'll refund your money. Period. No questions asked. A Sigil is created when a gifted psychic merges all the letters of a wish into a one-of-a-kind amulet. Very popular with heavy gamblers. May win big in lotteries, sweeps, bingo, at gaming tables. If you truly want to be deliriously happy and Deliciously in Luck, this is your chance to make your dream become reality. Are you in a situation that calls for drastic action, but you don't know what action to take? The Casino Buster spell will give you a chance to win like you've never won before. The Luck Wanga is for those who enter lotteries, play bingo, or want to change their luck.